The full moon in March is not quite as spectacular as April’s, but it has its moments. Like when the goofy Canadian geese Vee across it, honking like hounds, saying, “I’m here, where are you?” “I’m here, are you there?” When the wind is whipping horsetail clouds over the face of it, when it’s raining and the full moon light is still bright behind the heavy clouds, when there is one fat planet pretending to be a star, trying to rival the moon for its brightness, hanging over the lunar shoulder. March in Montana, popularly known as “Suicide Month”, when winter is still beating us up with cold, snow, ice, rain on the ice, flooding in the streets, the basements, garages. Even through closed windows sometimes you can hear crabby people arguing over nothing, or something too important to ignore. Grass on the lawns is flattened, not even daring to peel their green heads off the ground. I become so starved for a glimpse of color, for flowers that don’t come from the florists, that I stay inside and watch TV, disappearing from the nasty reality of outside. 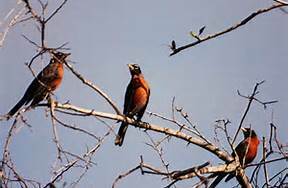 And yet, there can be a couple days of spectacular sunshine, melted snow races down the streets, a whole passel of early robins gather in a few big trees, scoping out nest sites, checking to see if that cute female is old enough to mate this year. Ravens coo to their wives, chuckling, flipping high on thermals, in love with life. Another silly made-up holiday blitz fills the stores, the bars, green everywhere, everyone wanting to claim kinship with the Irish, when one hundred years ago, signs were posted all along the Eastern seaboard to greet the starving folks arriving in steerage from Ireland. “NINA”, the signs said, “No Irish need apply.” My grandmother, Nora Kelleher, was one of those, sent away by her family at sixteen because they couldn’t feed her, arriving in Boston in cold March with twenty-five cents in her shabby pocket. Nora found work in a shirtwaist factory for six bits a week, just enough to keep her alive. How quickly we all forget, how easily things change. It feels like we are all waiting on tiptoe, wishing winter to be completely gone and for April to bring us fresh breaths, new hope, a clear love. And color, finally. This entry was tagged March, spring. Bookmark the permalink. What a apt way to describe March in Montana, Nan. I enjoyed reading your insight.